Kendo champ Suguri Toma may be super-athletic but he's not spectacularly bright. One day, a girl named Itsuki Aizawa shows up, and says she's on the run and needs someone to hide her. Toma is instantly smitten by Itsuki and vows to become her protector and help her make it to her upcoming ballet audition. But the next thing he knows, this blond dude named Karma shows up and snatches Itsuki away. Toma wants so badly to be with her that the next thing he knows he's willed himself to this other planet/dimension called 'Tao.' Turns out that there's life all over the universe but not enough resources to support everyone, so delegates from all the worlds have gotten together and decided there'll be a big tournament to determine who gets to survive. 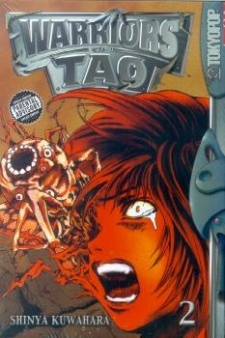 Toma was published in English as Warriors of Tao by Tokyopop from August 1, 2004 to May 10, 2005.